At the end of last year my boys became more familiar with Star Wars. Ever since, they have grown more and more in love with the characters from the classic movies and newer ones too. At the top of their Christmas list were Star Wars toys. When little brother’s spring birthday rolled around, he had to have a Lego Star Wars party. Ever since, Star Wars and kids has been on my mind. 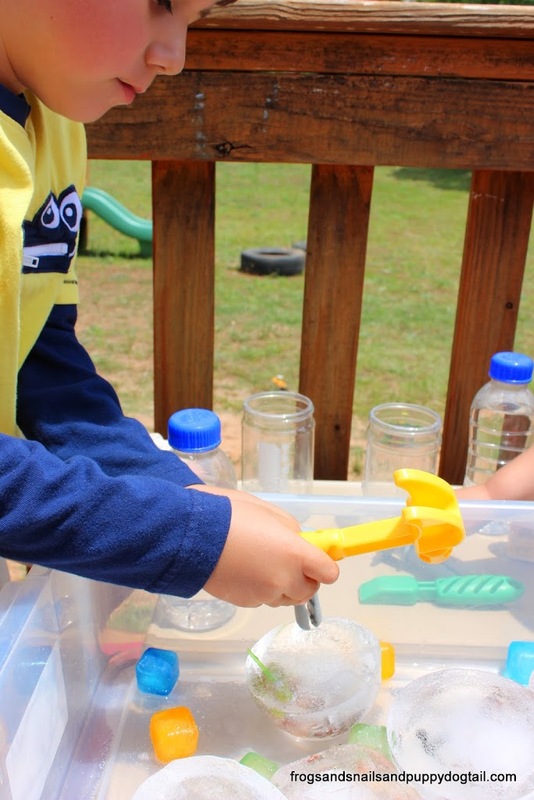 Since they played with the Star Wars characters so much, I wanted to come up with a way to include them in some of our sensory play activities. 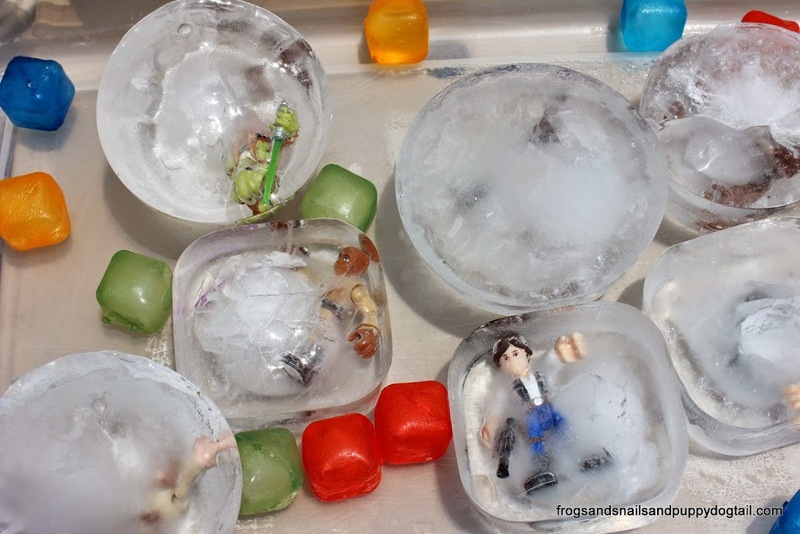 If you have ever seen the Star Wars series you can’t help but think of Han Solo and ice or freezing. 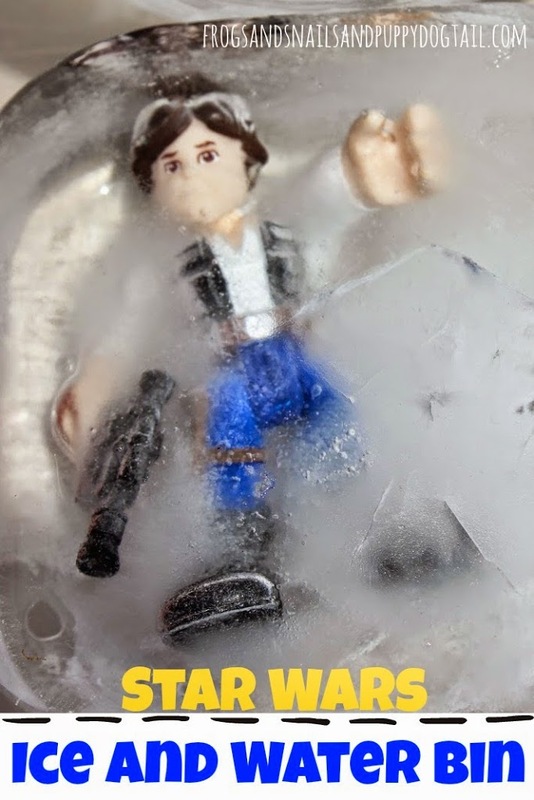 The idea to freeze the toy characters came to mind first. 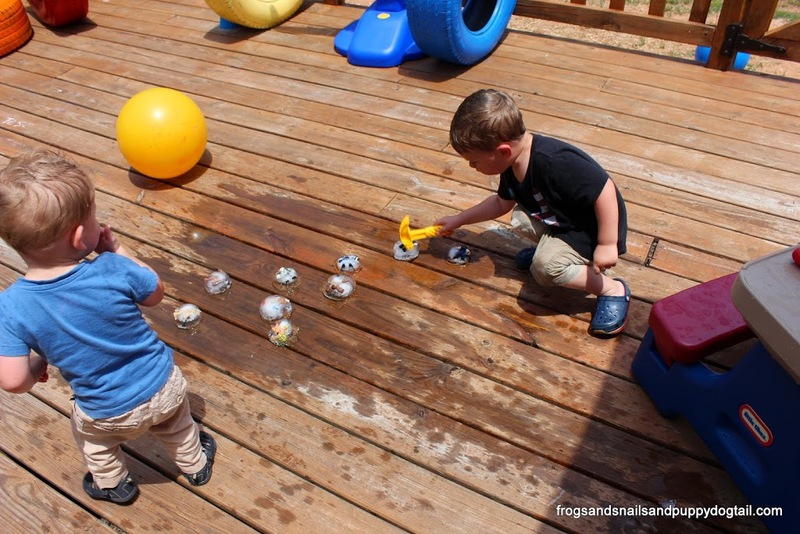 Here is how we played with an Ice and Water Bin Star Wars Style. I took small to medium plastic bowls and placed the characters in them. 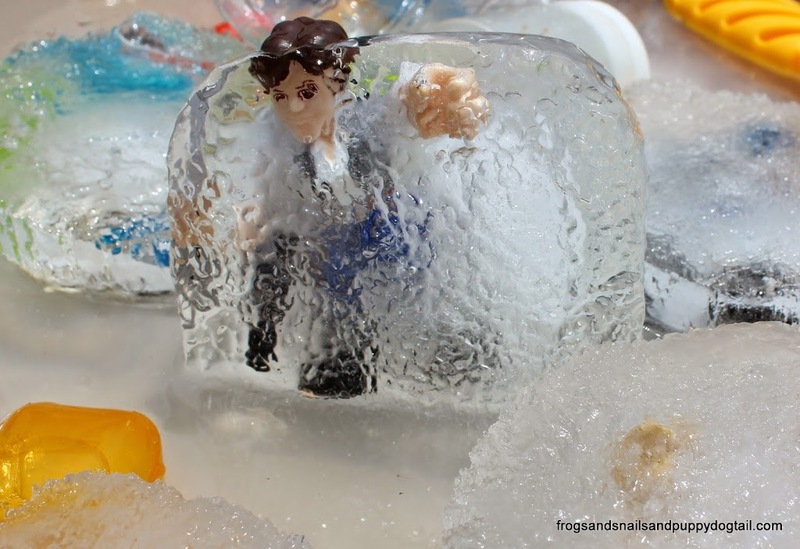 I then filled with water and placed in the freezer. They stayed there for a while until the day came to PLAY! 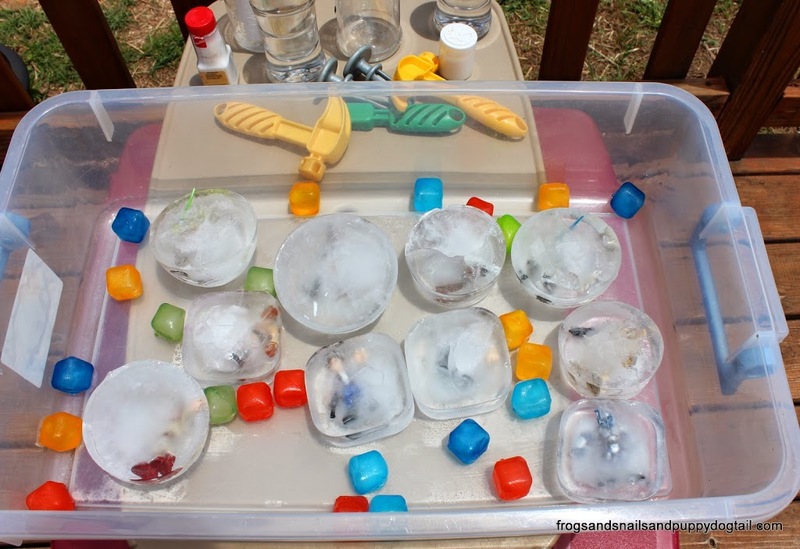 I placed all the Star Wars Ice in the large bin we use for playtime. I added our plastic frozen ice to the bin too. I filled a few empty sprinkles bottles with salt. Salt helps melt ice. 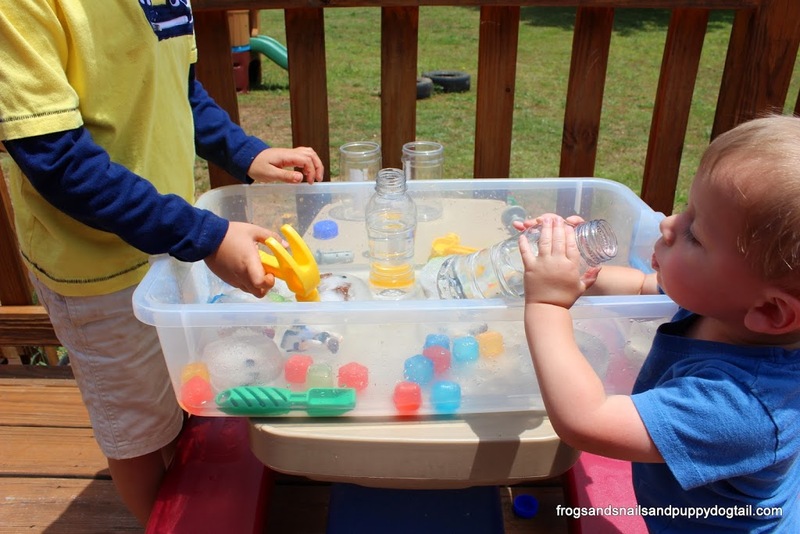 This was my way of adding a little science fun to our water play today. 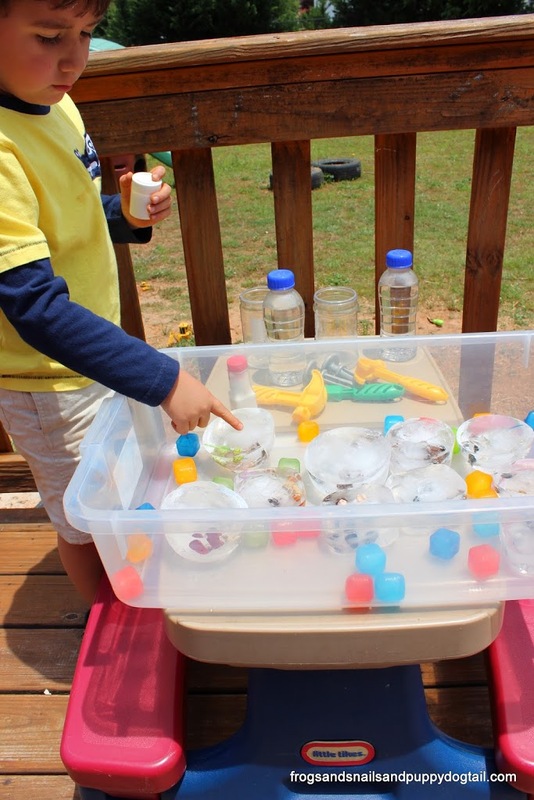 I also had bottles filled with water for them to add to the bin. Then I sat out their hammers and nails. These could be used to try and break the ice. Now they were ready to start playing and having fun. 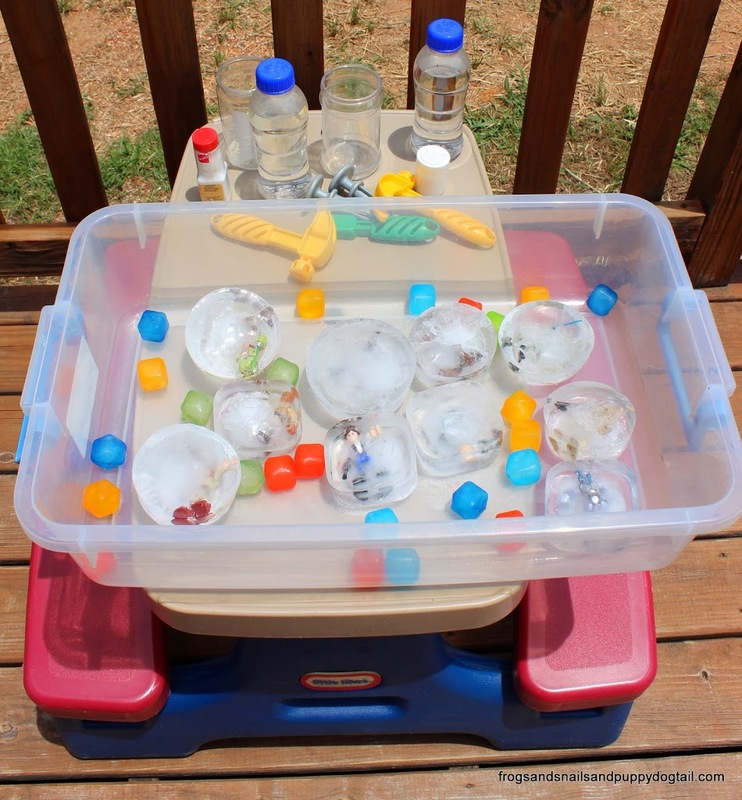 Ice and water are two cheap and fun sensory play materials. We can’t go wrong with them over here. They have been a favorite of my older boys during summer months. This year baby brother is really getting to enjoy them too. He loves to get right in there and play with them. What will it take to free the Star Wars characters? 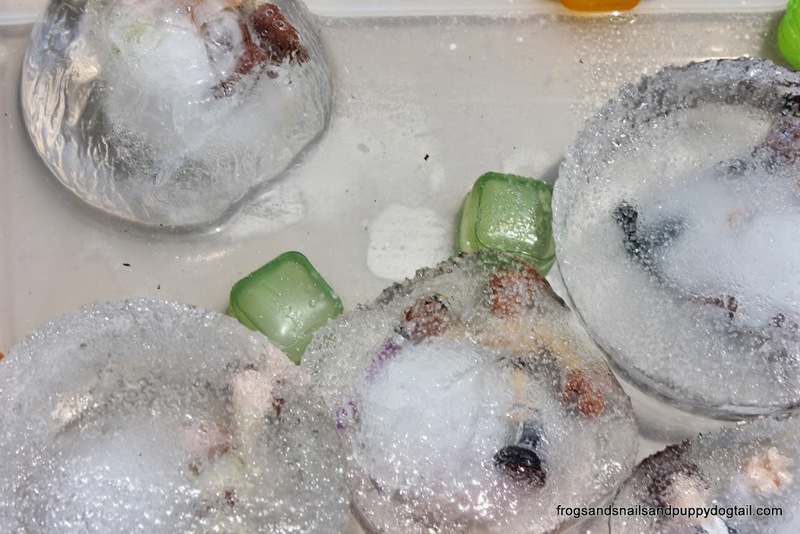 They set out to try and melt and break them out of their ice confinement. Problem solving at its best. Little brother loves to sprinkle anything out of the shakers. The salt was a big hit with him. I love the large ice and they do too. 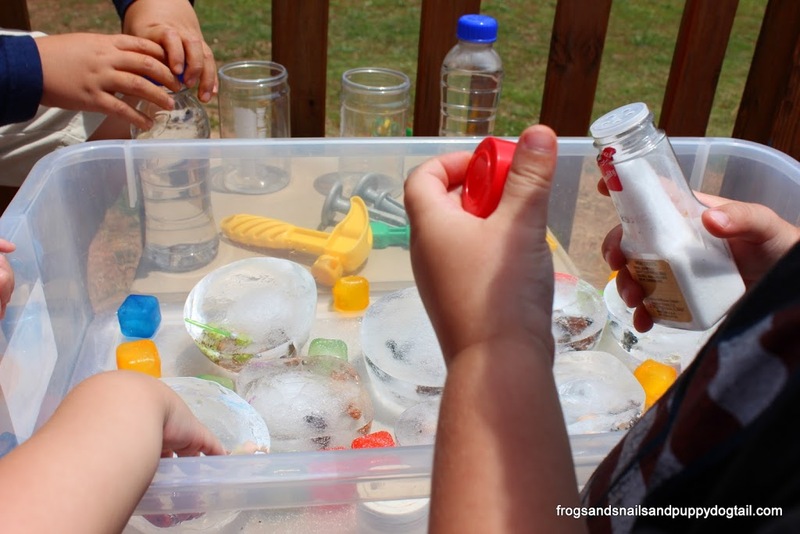 It takes longer to melt which gives them more time to play and investigate all the ways to melt it. Here is that baby brother I mentioned above. He loves to get right in there with his big brothers and play too. My kids are 5yr, 3yr, and 1yr. I have to keep this in mind when setting up play activities. 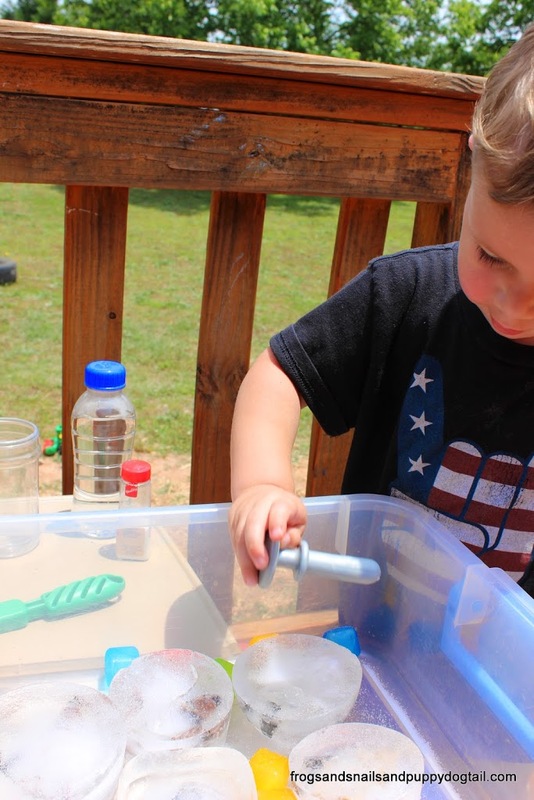 Almost all our activities are for multiple ages. Often they focus on the 2 older boys playing together. Now with baby brother getting older, it has been easier to add him to their playtime activities. I love watching them all play together. Hans Solo is starting to show through! I just love the boys creativity. 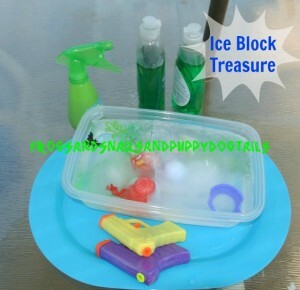 They even came up with their own idea on how to melt the ice. They placed the ice on the deck. 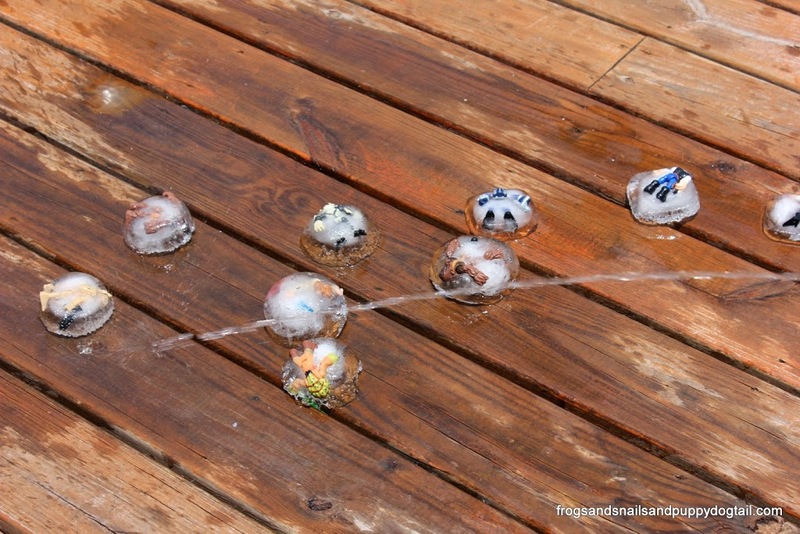 Then filled their water shooters and sprayed the ice. 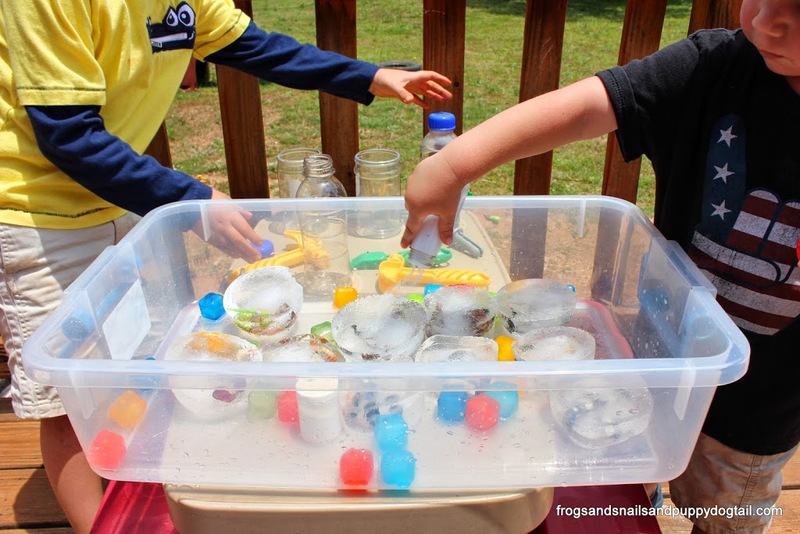 This was the fastest method they found to melt the ice. 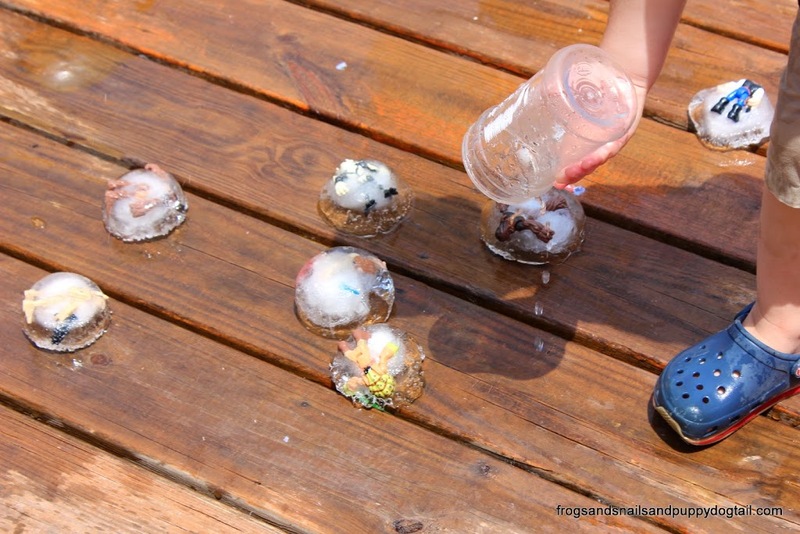 I just love how they took over and continued to explore what happened to the ice as they poured water on it and hammered it now on the deck. Perfect way to stay cool and play for us this afternoon. Star Wars Ice and Water Bin was a huge hit at my house. I hope you can have fun with it too. That looks like so much fun! I bet my kids would love something like this. Perfect on a hot day. Pinned and stumbled!